It’s been a fascinating week of games to watch for Hornets fans as this feels like our first real stint without Al Jefferson on the court ever since the big man arrived. It has thus also coincided with the first time in the Cho era that we’ve rolled out our starters and all of the five men on it are our own lottery picks. Our back-to-back lottery picks, in fact, disregarding last summer’s choice, Noah Vonleh, who’s still glued to the bench (I actually can imagine him sitting alone in a dark arena right at this moment at Clifford’s behest). The timing might seem a bit off, but, yes, that is actually a fact as Gerald Henderson was our last lotto pick (in 2009) before Bismack and Kemba in 2011. You might remember that in 2010 we infamously decided not to draft anybody in fear of botching the selection once again. Sure, feel free to look it up, nobody was picked with the 16th pick in that draft. (Alright, I lied – we traded the pick in a move for Alexis Ajinca, a sentence that shouldn’t be on any team’s resume). I expected our offensive numbers to be down whenever Kemba hit the bench during this last week. But, man, I didn’t expect it to be THAT low. We’ve scored 73.7 points per 100 possessions in the 39 minutes Kemba rested. There isn’t an ending for the sentence of “that’s the equivalent to…”. Possibly my favorite 4-man line-up, that I’ve already talked about before – Biz/Marvin/Neal/Roberts, hasn’t clocked a single minute during this stretch due to Biz’s promotion to the starting center position (for those keeping score, they’ve settled at 108.2 – 99.4 per 100 possessions, a nice achievement, with the sample size already being 90 minutes). They’ve been dreadful with Jason Maxiell as Biyombo’s replacement, hitting the court together for 26 minutes in the last week and finishing at a score of 86.5 – 101.9 per 100 possessions (they’re an even worse 79.4 – 106.1, in 41 minutes, for the season). Yet people are still able to take shots over Max and he still is a couple of steps slow on some plays just because his body can’t execute all of his wishes. Moreover, the Maxiell and Marvin Williams duo just shouldn’t be out there together so they wouldn’t get killed on the defensive glass (we were around 70% last week in defensive rebounding percentage when either of them was on the court, good for the league’s worst mark). I got a bit side-tracked though as the most important part of the story are the starters. If the offensive rating without Kemba is indicative of something, the same applies for our starting line-up’s 93.9 points per 100 possessions, which is near the disgrace that is the Sixers offense. Moreover, we’ve recorded that rating with two brilliant games by Walker. At this point it’s just all about Kemba. We’re toast if his shots aren’t falling (the Cavaliers and Rockets games…) because he was damn near doing everything out there. I seriously felt bad for the guy while watching how Boston rotated guys for a freaking full-court press on him. That team possibly has the best selection of guys for such a task. I have no idea how Kemba withstood 40 minutes on the road with Paul Pressey and Marcus Smart taking turns at getting in his grill. Howard isn’t just coming over to “tag” the screener, after a Hendo – Zeller pick-n-roll, he’s doing a full-body bump on Zeller while Ariza gets back in the picture. He can do that since he isn’t worrying about Bismack. Even if someone would ever attempt a pass to Biz on these plays, odds are Howard could get retreat back before Biz has gained 100% of control over the ball. 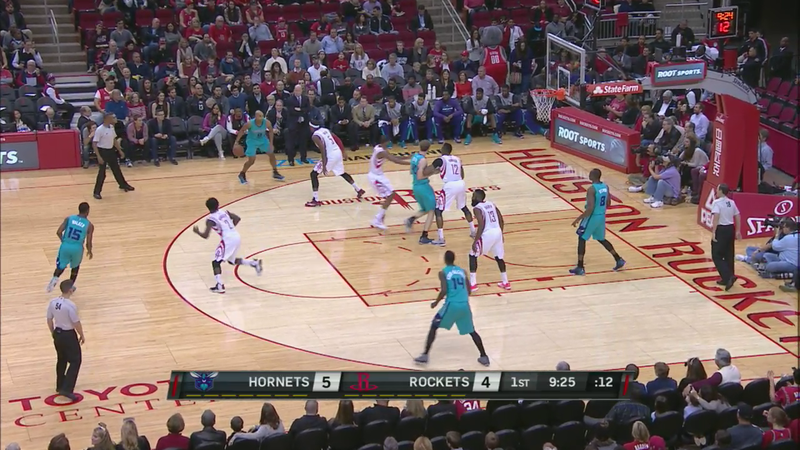 Not to mention the fact that James Harden is right by him, satisfied to ignore MKG and help out in the paint. I mean, in such a case, a 4/11 Kemba Walker night at Houston seems wonderful. When facing the Tobias Hariss’s and Kelly Olynyk’s of the world, he’s fantastic. There’s nothing they can do against a lightning quick Kemba Walker hesitation before he launches up the mid-range jumper, even with Kemba’s initial defender trailing right behind him. He’s also been splitting hedges by lesser guys routinely these last days. All I can say is – Bravo! The guy played his heart out. Him feasting on a team like Houston though, would truly require some miraculous shots, as he basically has been playing one on two. The Boston game did show Cody’s potential to give us some breathing room in the pick-n-roll game with him knocking down all of his shots from the field. That possibility, for now, comes and goes with Zeller’s shooting. What is even more important than the shooting part of his game is his decision-making. Right now we’re in the early stages of the Zeller pick-n-roll experience, mostly having him pop out for the 18-or-so-footer. At some point though you have to become adept at making decisions in the pick-n-roll on the fly, when catching the ball around the foul-line area, per example, and having to read the situation in a split-second. The ability to make a pass to the corner to the shooter in one motion, a serviceable floater from that often so awkward area for shooting or the cool mind simply not to barrel in the guys crammed in the paint ahead of you – all are vital skills to make it work. Zeller is still getting used to the NBA game and at this point catching the ball on the perimeter with a maniac like Patrick Beverley denying the passing lane to Kemba is enough of a challenge for him. That would be an improvement we would need if this line-up ever worked out on offense. It was a taxing week for Kemba and he should be ready for more of the same before the release valve of a Jefferson post up returns since it won’t get any easier. This line-up just can’t provide a steady flow of NBA-level scoring. Moreover, a massive spike in offensive rebounding percentage helped our cause last week. It’s typically a place where bad, yet big offenses can search for extra points. We’ve mostly abandoned the glass under coach Clifford, but Biz and Cody playing together, obviously, helped those numbers and it did seem as if our guys had a bit more freedom to venture after those possible second chance opportunities, which would seem like the right recommendation to make to our players with everybody else falling apart on offense. Us being horrific, despite the 29.6% offensive rebound percentage, is a bad sign. Our starters have held opposing offenses to only 86.4 points per 100 possessions, for a net rating of +7.6, during the last week. It has come against Orlando, Boston, a LeBron-less Cleveland and Houston, but the blueprint for a great defense was there. This is where this particular group of guys do work together. With two mobile bigs, one suitable for containing pick-n-rolls in Biz and one comfortable with defending further away for the basket in Zeller, and two wings who can deny the middle or help from the weak-side before successfully hoping back out to their assignment, this group can provide opponents plenty of difficulties. Now, again I acknowledge that Orlando and Boston isn’t the cream of the crop and in certain situations on these highlighted plays the opponent’s lack of shooting helped us, but the way that line-up cohesively moved around is a skill, no matter the opponent, whether it’s the first play of the montage where it’s a mess and everybody is frantically covering up for the previous guy and as a team we’re closing out on everybody, or it’s about being on time and in the right place per our defensive principles after the initial pressure on the pick-n-roll. All of that is movement and fluidity from one guy to another that is impossible with Jefferson manning the middle. Then we’re back to scrambling to help Al in the pick-n-roll, only to get threes raining all over us. It isn’t a coincidence that opponents were 21.4% from the left corner during the last 4 games, a vulnerable spot whenever we’re defending with Al in the game. A couple of more random plays that I enjoyed… Cody flying all over the place while hedging the Channing Frye pick-n-roll, as if we never got burnt by it. Holding up on defense against the Raptors and the Spurs during the next week would really mean something. I’m looking forward to seeing those games. Hey, have you noticed any improvement in MKG’s ability to space the floor? Much made of improved form etc etc. Judging from your columns and the two full games I’ve seen of the Hornets (not much, I know) it doesn’t seem so. Great insight as always. I at least hold the opinion that the league is usually slow to catch up with other player improvements in shooting. It’s much more about perception than percentages. Someone like Thabo Sefolosha might supposedly improve and have a great season but at the end of the day he will still be tested come playoff time (and, by the way, he failed that test). Mike has got better but I still think we have a long road ahead of us. He might develop a corner three one day but it will take a few years before it will become respected, if it ever does. Yeah, so far opponents have been happy to play off him as much as they always have. I look forward to our battle today, midday games are a godsend. Prepare to feel the wrath of Cole Aldrich’s right hook. Seriously, it’s like our best option right now. This entry was posted on January 7, 2015 by ReinisLacis in Charlotte Hornets blog and tagged Bismack Biyombo, Cody Zeller, Jason Maxiell, Kemba Walker, Marvin Williams, Rich Cho.